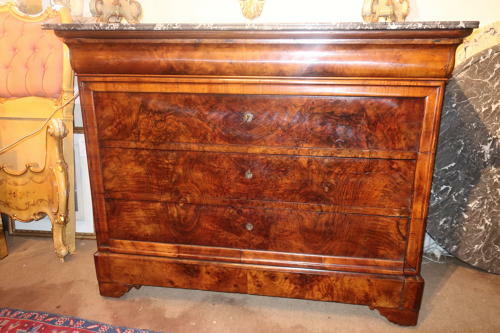 A French Louis Philippe Commode in burr walnut. Good warm colour with four drawers the bottom drawer being oversized able to accommodate bigger items all sitting on pretty shaped bracket feet with a grey and white marble to the top. Excellent condition with no splits to the sides and all drawers have been made to run very smoothly. Good original condition.